1Once during a seminar for graduate students of color held at the university where I teach, two colleagues spoke on the importance of having a mentor. One colleague particularly stressed the choosing of someone who does not necessarily have to be a person of color. What should matter, she emphasized, is whether or not the mentor is supportive and avoids trying to make the student a duplicate of her or himself. While listening to my colleague’s speech I realized how fortunate I had been with the mentors who encouraged me during my studies. One of them who graced my graduate student days and continues to do so during my professional life is Michel Fabre. 2It was during the fall of 1972 that I first met Michel Fabre. I had traveled to Paris, France, to work with a professor on my doctoral dissertation. In preparation, I had corresponded with the professor who agreed to supervise my doctoral dissertation. Upon my arrival in Paris in early October 1972, I learned, to my surprise, that the professor had been invited by Léopold Sédar Senghor, the then President of Senegal, to spend a year at the Université de Dakar. Cast adrift and unfamiliar with the French university system, I searched in vain for another advisor and questioned why the professor did not apprise me of her situation and/or arranged for me to work with someone else since I was a newly arrived foreign student. I virtually canvassed the Sorbonne, knocking on various professors’ doors and explaining my precarious situation. Finally, I summoned up enough courage to knock on Monsieur Fabre’s office door for I had previously read his well-known study on Richard Wright. 3As soon as he heard my knock, Monsieur Fabre commanded me to enter. Seeing a young-looking, slightly built man with thick glasses and a beard, I haltingly explained my situation. “You arrived a day too late,” he told me. “I already have my quota of graduate students.” Seeing my look of despair, Monsieur Fabre took pity on me, suggesting I should contact Stanislas Adotevi at the then Jussieu-Paris 6 in ethnology. “Ethnology?’ I squeaked. “My area is literature; I know nothing about ethnology.” Having no choice, I followed Monsieur Fabre’s advice and, to my relief, Monsieur Adotevi agreed to work with me as long as I enrolled in his course and one of Monsieur Fabre’s. 4As an African American student and a graduate of an historical Black college in the United States, I was elated to be studying the “Ethnology of the Afro-American World” (Adotevi’s course) and “Afro-American Literature” (Fabre’s course). Never had I formally taken a course about the African American experience at an American university. What I knew about African American history and literature I had learned on my own in an informal setting and through the attendance of many readings and lectures by African American writers, historians, critics and politicians on several historical Black college campuses. How ironic. In order for me to study about my people and their contributions to the United States, I had to leave my country of birth to go to France where African American literature was seriously taught, studied and chosen as thesis topics for graduate degrees. 5While immersed in my course work I found out that the learning process is continuous. On the first day of attending Monsieur Adotevi’s class, Monsieur Fabre entered the room and sat beside me. From then on, Monsieur Fabre often came to Monsieur Adotevi’s class because he had registered for a master’s degree in anthropology at Jussieu. Although he had already acquired the doctorat d’état and been teaching on the university level for eight years, Monsieur Fabre wanted to learn more about African American and Haitian social and cultural practices in order to direct the newly established Centre des Etudes Afro-Américaines et du Tiers Monde Anglophone at Paris III. From time to time, Monsieur Fabre and I engaged in a conversation at the end of the class period. After I had given an oral presentation for his class, Monsieur Fabre told me he would reconsider working with me if I should decide to spend another year in Paris. If I had to squeeze every penny I had from my scholarship or to find a part-time job, I was determined to stay in Paris and to transfer to the Sorbonne Nouvelle-Paris III. 6During the transition, I realized how myopic the educational system was in the United States. For instance, whenever I studied anything about America, or North America, the focus was always on the United States. However, the philosophy of the Centre des Etudes Afro-Américaines et du Tiers Monde Anglophone was that Canada, Mexico, the Caribbean and the United States all encompassed the North American region. Therefore, Monsieur Fabre was not surprised when I wanted to do a comparative study on the influence of the Harlem Renaissance poets upon the Caribbean and African négritude poets. Instead, he advised me on which libraries I should consult and queried me on what I had previously read about the two literary movements. 7My self-discipline and study skills improved even more under Monsieur Fabre’s supervision. He expected me and his other graduate students to go beyond the basics. Never did he coddle me because I was a foreign student. Since I had registered in the program with other French students, I was to abide by the same rules and regulations. He simply explained the system of compiling bibliographical data and the format of the proposal that I had to submit to the central office of the Service des thèses at Nanterre for the official approval of my dissertation topic and admittance into the doctorat de 3e cycle. He usually scheduled a meeting once a month to assess my progress. Recommended readings would be added on to my list of things to do. Yet, Monsieur Fabre did not exercise a controlling manner; he just nudged me in the right direction and allowed me to be the one to reveal the latest information. He thereby allowed me the space and time to move along at my own pace and validated my opinions. 8Participating in Monsieur Fabre’s courses, engaging in conversations with my classmates, and listening to their comments in class about African American writers all aided me in my internal journey. Living and studying in Paris for two years were an adventure, a validation of who I was. Often I was questioned by my classmates about being an American. However, I explained to them that “my” experiences did not represent over 28 million African Americans. My position was reinforced when Monsieur Fabre required the class to read Dudley Randall’s anthology Black Poets (New York: Bantam, 1971), invited Addison Gayle, an African American literary critic, and the poet Ted Joans to class, and encouraged us to attend literary conferences in Créteil and Nanterre. By meeting the movers and shakers of African American literature, my classmates understood that African Americans did not necessarily adhere to a monolithic viewpoint about language, racism, survival and self-pride. 9Even I learned a lesson about self-pride. After Monsieur Fabre read the first draft of the introduction and two chapters of my dissertation, he asked me to revise and restructure them in the French writing style. Accustomed to writing in an abbreviated American style, I struggled to learn how to digress and to manipulate the French language without going directly to the point. Three revisions later, and by and large, Monsieur Fabre finally gave his approval on the first three chapters. By this time, my second year of studies and funding had come to an end and I had no choice but to find a fulltime job. Reluctantly, I told Monsieur Fabre I would have to complete the dissertation in the States or wherever I found a job. 10Luckily, my upbringing and the two years with Monsieur Fabre prepared me to be disciplined enough to finish the dissertation so far away. Also, upon my return to the States, my father, who was also a university professor, would inquire about my progress and remind me that many students washed out during the dissertation stage. Yet he would add that he was certain that I was motivated enough to finish. How right my father was. Every time I mailed a chapter to Monsieur Fabre a heavily marked paper with comments would be returned several weeks later. Yet I was spurred on by him and my father to do the revisions. Finally, I completed the typing of the second draft of the entire dissertation and wrote Monsieur Fabre about my worry: Did I hear that the French postal workers were on strike again? Monsieur Fabre responded that he had to visit the critic Edward Margolies in New York and asked if it would be possible for me to meet him there. Accompanied by my father who wanted to meet the professor who had written The Unfinished Quest of Richard Wright (New York: Morrow, 1973), I drove to New York and happily handed over the document that I had spent numerous hours on. Years later, Monsieur Fabre told me how pleased he had been to meet my father because he had read one of his books, too. 11Monsieur Fabre did not only extend himself to carry back my dissertation to France; he also found me a typist in Paris for the third and final version of the dissertation while I began a teaching job in Gabon, Central Africa. Since I was thousands of miles away from Paris, Monsieur Fabre also deposited copies of the final draft of the thèse at the Sorbonne for me and encouragingly counseled me to be very familiar with the content for the defense. Happy that the process was almost near completion, I flew to Paris from Libreville, Gabon, and immediately visited Monsieur Fabre at his home to ask for a final draft of the dissertation. To Monsieur Fabre’s dismay, he realized that I had paid a hefty sum for the typing. However, not enough copies had been made so that I could have one. Both of us were embarrassed. I also felt bad because he had gone beyond the call of duty as an advisor. To salvage the awkward situation, Monsieur Fabre advised me to approach the librarian at Sorbonne III about giving me a copy. After a very heated argument with the librarian she reluctantly and temporarily “lent” me one of the two copies. A document that I had paid for! As soon as I successfully defended the dissertation, Monsieur Fabre offered me his copy, but one of the other faculty members on the committee gave me his. 12Fortunately, my relationship with Monsieur Fabre did not end when I received the doctorate. He wrote favorable letters of reference whenever I applied for university jobs in the States. I, in turn, kept abreast of his publications and required some of them to be studied for my courses. During a trip to Paris in 1984 I met him at a patissserie in the Quartier Latin where we exchanged stories about our travels and research. Then I lost: contact with him until February 1992 when he and some American professors from Harvard University organized a historical conference on Afro-Americans in Paris. When I saw him, I berated myself for not staying in touch. In December 1999, we both participated in a conference on jazz and African American literature at the Université des Antilles et de la Guyane in Fort-de-France, Martinique. This time I did not have to contend with masses of people who had surrounded him in Paris in 1992. Instead, Monsieur Fabre, his wife Geneviève and I leisurely shared meals and conversed on a range of topics. 13One topic was about his current scholarship. Since learning is an ongoing process for Monsieur Fabre, he continues to write about African American writers. Yet, learning is also a two-way street and he inquired about my own research. When I explained that my book on popular French Caribbean songs, music and culture would be published in May 2000, he offered to review it for an academic journal. Flattered, I, of course, sent him a review copy as soon as the book was published and an excerpt from his review is located on my web site. 14When people in the States ask me at which university I received my doctorate, they express surprise when I mention the Sorbonne. Yet, they are even more impressed when I tell them who I studied with. After a stunned moment of silence, they ask how I was able to accomplish such a feat. I only smile and tell them it was pure luck. On the other hand, they don’t understand how risky it had been. To leave the United States to study in France was a risk, which was frightening. Yet, the risk was well worth it. If not, I would not have had the opportunity to work with Monsieur Fabre. 15From 1964 until 1969, Monsieur Fabre taught American literature at Nanterre. His next move was to Vincennes-Paris 7 where students were clamoring for one seminar or more about the African American experience. In response, he taught a course on “Black Power” from October 1968 until June 1969. That summer three of his students who had thoroughly enjoyed the course, spent three months in Harlem. Meanwhile, in October 1969, Monsieur Fabre shifted to Paris III where he introduced a course on James Baldwin in 1970 for the agrégation. Next, he became involved in introducing a doctoral program for and the director of the Centre des Etudes Afro-Américaines et du Tiers Monde Anglophone. Later, the name of the center was to be changed to Centre des Etudes Africaines Américaines et des Nouvelles Littératures en Anglais. By the time Monsieur Fabre retired in the 1990s, he had served on 222 jury committees for doctoral candidates at the Sorbonne. 16Participating in Monsieur Fabre’s courses and engaging in stimulating conversations with my classmates about African American writers all aided me in my internal journey. The two years I spent in Paris caused me to reassess who I was. Living and studying in Paris was an adventure, a validation of who I was. I often questioned what it meant to be an American beyond the boundaries of the United States, not only an African American. Coming from a country where the color of my skin is of primary importance did not prepare me for the positive reception that the French directed toward African American writers, visual artists, and musicians. Talent was more important than the person’s skin color. In addition, my American nationality rather than my African American ethnicity was prioritized by the French. On the other hand, I was not too naive to understand that such a reception did not necessarily occur for people from the formerly colonized African nations by the French. 17Over the years, I have arrived at the realization that mentors come in all sizes, races, and nationalities. It is not a requirement for someone to look like me to be my mentor. People are misinformed if they think a mentor must share the same culture as them. If that were so, many African Americans would not be successful or be the first to do something. I, for instance, was one of the first students to complete a doctoral degree with Monsieur Fabre as the primary reader. 18I was also one of the two African American graduate students who finished under his supervision. During the time, I was under his guidance I became more self-confident in my abilities, and most of all, Monsieur Fabre’s subtle approach brought out the best in me. 19Unassuming but firm, Monsieur Fabre possesses the qualities that I look for in a mentor: humble, helpful, compassionate and well informed. Someone who keeps abreast of the latest development in his field of expertise. I would not be the person I am today if it were not for people like him who helped to show me the way. To express my gratefulness, I try to extend myself to students in a likewise humble manner. Helping students serves to help myself and others. It also causes me to remember that learning, support and guidance all come from people from a rainbow of colors. Brenda, F. Berrian, 2000. Awakening Spaces: French Caribbean Popular Songs, Music and Culture. Chicago: University Press. 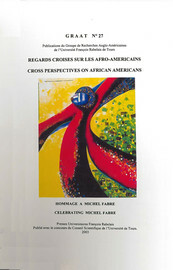 BERRIAN, Brenda F. A Tribute to a Mentor In : Regards croisés sur les Afro-Américains : Mélange en l'honneur de Michel Fabre [en ligne]. Tours : Presses universitaires François-Rabelais, 2003 (généré le 21 avril 2019). Disponible sur Internet : <http://books.openedition.org/pufr/4174>. ISBN : 9782869064690. DOI : 10.4000/books.pufr.4174. Berrian, Brenda F. “A Tribute to a Mentor”. Julien, Claude. Regards croisés sur les Afro-Américains : Mélange en l'honneur de Michel Fabre. Tours : Presses universitaires François-Rabelais, 2003. (pp. 141-146) Web. <http://books.openedition.org/pufr/4174>.